You have 0 Galaxy points. Lead back to time studies. You get 2.2x more IP per mult upgrade. Remote cost scaling starts 1 galaxy later per 3,000 dimension boosts. Remote cost scaling starts 1 galaxy later per 7 free galaxies. Remote cost scaling starts 20 galaxies later per 9 extra replicated galaxies. Dimensional boost costs scale by another 1 less. Dimensional boosts affect Meta Dimensions at reduced rate. Meta-dimension boosts affect dilated time production. You gain more tachyon particles based on your galaxies. You can buy replicate chance upgrades over 100%. Post-400 max replicated galaxy cost scaling is reduced. You can buy beyond 1ms interval upgrades but the cost starts to increase faster. Pick all paths on all 3-way splits in time studies. Replicate chance is massively increased. Replicanti multiplier boosts DT production at greatly reduced rate. Replicanti multiplier boosts Meta Dimensions at greatly reduced rate. You gain 1% of your EP gained on eternity each second. You can gain tachyon particles without disabling dilation. Remote cost scaling starts 1 galaxy later per 4.15 extra replicated galaxies. Pick all time studies before mastery studies. Meta Dimensions are stronger based on your galaxies. Replicanti multiplier to Infinity Dimensions is 17.3x stronger. Meta-dimension boosts are 4.5% stronger and cost scale by 1 less. If the multiplier per ten dimensions does nothing, it actually multiplies dimensions by x.
Tickspeed boosts DT production at greatly reduced rate. Cancel dilation penalty for Normal Dimensions boost from replicanti. Dimension Supersonic scaling starts 340,000 later and increases cost slower by 3 less. You gain replicanti faster based on your normal galaxies. Preons boost DT production at reduced rate. All replicated galaxies are stronger and use the same formula. Free galaxies are as strong as a normal replicated galaxy. Replicated galaxies are more effective based on your preons. Time Shards boost all Meta Dimensions. Hatch speed is faster based on your tachyon particles. Reduce the softcap for preon boost. Hatch speed is faster based on your extra replicated galaxies. Hatch speed is faster based on your time shards. You get more preons based on your galaxies. Hatch speed is faster based on your tickspeed reduction multiplier. Eighth Dimensions boost Meta Dimensions. Blue power boosts Meta Dimensions. Hatch speed is faster based on your meta-antimatter. Preons boost all Emperor Dimensions. The production of preon anti-energy is slower based on your preons. Emperor Dimensions and hatch speed are faster by 25x. The production of preon energy is faster based on your replicants. Preon effect is 25% stronger. You have 0 ex-dilation, making dilation 0% less severe. Double the dilated time production. Tachyon particle formula is better. Replicanti increases faster based on dilated time. Eternities and dilated time power up each other. Gain a multiplier to meta-dimensions based on tickspeed. Meta-dimension shifts, boosts, and per-ten upgrades are boosted by dilated time. 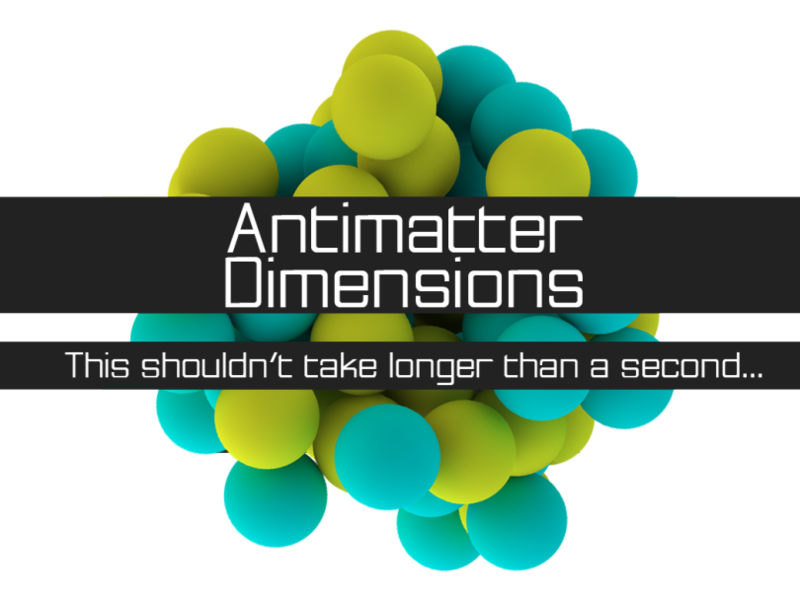 Meta-antimatter effect on dimension boosts is stronger. Dilated time production is boosted based on best meta-antimatter. You are getting 0 black hole power per second. was 0. ranslated to 0x . You are getting 0 meta-antimatter per second. You have 0 normal replicants. You have 0 quantum food. You will gain x banked infinities on next Eternity. Get your best quantum to reach below the requirement for a reward! You can only get 308 tickspeed upgrades. This count does not reset on resets. All galaxy upgrades from the third column are disabled and tickspeed boosts give 15 free tickspeed purchases instead. No reductions on galaxy and dimboost cost increases, but infinity upgrades based on time or infinities are applied post-dilation. Reward: Infinity upgrades based on time or infinities are applied post-dilation. Also make the GP formula better based on galaxies. Dimension and tickspeed cost multiplier increases start immediately, but are square-rooted. Reward: Cost multiplier increases are x^.9, and tickspeed cost multiplier increase is further lowered based on galaxies. Multiplier per ten dimensions and dimension boost power are always 1x and tickspeed boost effect softcap starts immediately. Reward: Tickspeed boost effect softcap is softer. All normal dimension multipliers are disabled except infinity power, but galaxy boost on infinity power is stronger. Reward: Dimension & tickspeed boosts also boost infinity power. Tickspeed multiplier to dimensions is always at 1x, but every tickspeed purchase decreases tickspeed based on galaxies. Dimension boost multipliers of Normal Dimensions and Infinity Dimensions are disabled. All IC3 rules are applied, but only replicanti boosts Infinity Dimensions, free tickspeed upgrades increases IC3 reward 5 times instead, and meta-antimatter does nothing. Spend electrons to start quantum challenges. Dimensions 3-8 don't produce anything. You don't lose everything when you buy Normal Dimensions or tickspeed. Infinity Dimensions can only be boosted by meta-antimatter. Meta-antimatter never boosts dimension boosts. Like Automatic Crunches challenge, but also applied to all dimensions. Meta-dimension boost costs increase slower and buffs are removed. Dimension Supersonic scaling starts instantly and grows much faster. Replicated galaxy cost and free galaxy threshold also grow much faster. Multiplier per ten dimensions is disabled. All Infinity Challenges except IC1, IC4, and IC5 are applied to all dimensions except Meta Dimensions. You can't gain and lose dimension boosts or else you will fail. Multiplier per ten meta dimensions is a little bit stronger. Infinity Dimensions, Time Dimensions, and Meta-Dimension Boosts are disabled. Reward: Boost the reward for these sub-challenges. You have x galaxy points. Normal dimensions gain a multiplier based on time since last galactic sacrifice. Normal dimensions gain a multiplier based on your galaxy points. Tickspeed boosts give 32 free tickspeed purchases each. Dimension boost scaling starts 2 later and increases the cost by 5 each. Galaxies are 5x stronger, reduce the cost by 20 less except the first, and decrease the cost multiplier to 30. Dimension boosts are stronger based on your galaxy points. Increase the multiplier of the product of bought based on your galaxy points. Gain more galaxy points based on your total antimatter. Multiplier per ten dimensions is stronger based on your galaxy points. You get 4 free normal galaxies. You get 10 free tickspeed upgrades each. Increase the limit of Infinity. All dimension boost costs are decreased by 30 each. All galaxy costs are decreased by 20 each. You have sacrificed Infinity points. You have 0 singularity power. Sacrifice all of your infinity points, but gain singularity power. You have 0.0 dark matter. Translated to 1.0x faster tickspeed. You are getting 0 dark matter per second. Next 2x dark matter production unlocks at sacrificed IP. You have 0.0 dark matter. Next discounts at 0.0. All of your dim-techs gave 0 discounts. You have 0 red quarks. You have 0 green quarks. You have 0 blue quarks. They have a 0 charge, which produces 0 per second. You have 0.0 red power. Translated to boosted 0.0% increase in galaxy efficiency. You have 0.0 green power. Translated to 0% increase in extra replicated galaxies. You have 0.0 blue power. Translated to 1.0x dilated time production and 1.0x production from all Meta Dimensions. You have 0 red-green gluons. +0 on next quantum from red quarks. You have 0 green-blue gluons. +0 on next quantum from green quarks. You have 0 blue-red gluons. +0 on next quantum from blue quarks. Remote galaxy cost scaling is reduced. Galaxies are more effective based on your free galaxies. You gain replicanti faster based on your tickspeed reduction multiplier. Replicate interval scaling is 2x slower. You gain more tachyon particles based on your dilated time. Sacrifice affects dilated time production. First Meta Dimension is boosted by dimension boosts. Galaxies are 50% stronger, but electrons are 30% weaker and normal galaxies are 60% weaker. You get 2.3x more IP per mult upgrade. Massively decrease the tickspeed cost multiplier increase to 1.25x. Tachyon particles boost the dilated time production more by a little bit. Multiplier per ten dimensions boosts Meta Dimensions. Slow down Dark Matter Galaxies effect by 13%. Slow down Distant Antimatter Galaxies effect by 13.2%. Replicated galaxies slow down Dark Matter Galaxies effect. Infinity power slows down Distant Antimatter Galaxies effect. Tachyon particles slow down Dark Matter Galaxies effect. Meta-dimension boosts slow down Distant Antimatter Galaxies effect. Slow down Remote Antimatter Galaxies effect by 10%. Red unstable quarks decay slower based on your RG gluons. Infinity Points slow down Remote Antimatter Galaxies effect. Green unstable quarks decay slower based on your GB gluons. Eternity Points slow down Remote Antimatter Galaxies effect. Blue unstable quarks decay slower based on your BR gluons. You gain 2x more quarks. Raised to the power of 1.00, multiplier per ten dimensions is currently 2.00x. You will gain 2 electrons per galaxy when you sacrifice. You have 1 red-green, 1 green-blue, and 1 blue-red gluons. They are gathering 0 preons per second. You have 0 total worker replicants. They are gathering 0 preons per second and producing 0 eggons per minute. You have 0 baby replicants. Translated to +0% added green power. You have preon power. Next at preon energy. You are getting preon energy per second. You have preon charge. You are getting preon charge per second but losing preons per second. You have preon anti-energy. At , your preon charge will stop producing energy and anti-energy. You are getting preon anti-energy per second. Hatch speed is 1x faster. Meta-antimatter effect power is increased by 0.0x. Free galaxy gain is increased by 0.0%. Dilated time multiplier power on Meta Dimensions is 0.100x. While dilated, Normal Dimension multipliers and tickspeed are raised to the power of 1.0. Meta-dimension boost power is increased to 3.0x. Remote galaxy cost scaling starts 0 later and the production of preon charge is 1x faster. Add 0.00x to multiplier per ten dimensions before getting affected by electrons and the production of preon energy is 1.0x faster. You have 0.0 red quark spin. You have 0.0 green quark spin. You have 0.0 blue quark spin. Meta Dimension Boosts are cheaper. TP gain formula exponent is increased. All branches are faster based on how many upgrades you bought. Per-10 boost from electrons is increased. All branches are faster based on your best-ever meta-antimatter. Replicanti boosts dilated time production. Your best meta-antimatter for this quantum makes the meta-antimatter effect stronger. If you are stuck on the loading screen, please click "Init" to force init or "Reload" to reload. If you have reloaded the game and the game still breaks, I recommend you to export the save. Click "Load" while holding shift to load a save but w/o offline progress.